Keeping it chill for Zotac's 10th anniversary. 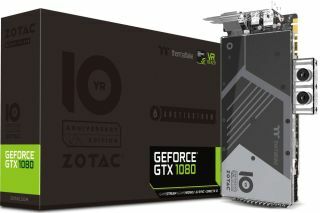 No, you're not having déjà vu and yes, Zotac already announced a liquid cooled GeForce GTX 1080 ArcticStorm graphics card a couple of months ago. What's different about this new entry, designed in collaboration with Thermaltake, is that it's a 10-year anniversary edition with some additional features to celebrate the occasion. Zotac unveiled the card at press conference in Hong Kong. "I would like to acknowledge our staff’s effort in making this happen – both this event and the past 10 years," said Tony Wong, CEO, Zotac International. "Since putting the name Zotac onto the things we make, we have never stopped finding ways to make it even better. Our ultimate vision is to put Zotac into every piece of technology we use." To celebrate 10 years in the business, Zotac wanted to offer what it claims is the "ultimate liquid cooled graphics card." The result of that effort is a second version of the previously launched GTX 1080 ArcticStorm, this one with a completely new printed circuit board featuring a 16 power-phase design, as opposed to the traditional 8+2 power phase design. By upping the ante here, Zotac says users benefit from significantly greater power regulation at higher speeds. Therein lies another benefit—this one comes clocked slightly higher than the non-anniversary card. It features base and boost clockspeeds of 1,657MHz and 1,797MHz, respectively, up from 1,632MHz and 1,771MHz. You can still tap into those latter clocks, as this new card also has two BIOSes to play with. The default BIOS (BIOS 1) is configured with the faster clockspeeds, while the other BIOS (BIOS 2) is programmed with the previous card's clockspeeds. Zotac's Firestorm utility lets you switch between the two BIOSes as well as play with clockspeeds, fan speed settings, lighting effects, and monitor vitals. Finally, the new card features a slightly different looking full-cover waterblock and comes with a limited edition Zotac SLI HB bridge. Zotac didn't say when the card will be available or for how much.